The easiest way to design and cut signs, graphics, logos, lettering, shapes, decals and stickers. Take your sign-making to a whole new level with Easy Cut Studio. The #1 vinyl cutter software for Windows and macOS. The complete solution for designing, printing, cutting and print+cut. It gives you the ability to cut any TrueType font, OpenType font, graphics, SVG, PDF, as well as your own original designs with your cutting plotter. This awesome vinyl cutting software even supports vectorize your images and built-in shape library includes hundreds of vectorial designs ready for cutting. With intuitive interface, Now anyone can cut designs like a pro! Professional sign cutting software for your vinyl cutter. Both macOS and Windows versions available now. Drawing and Designing couldn’t get any easier! 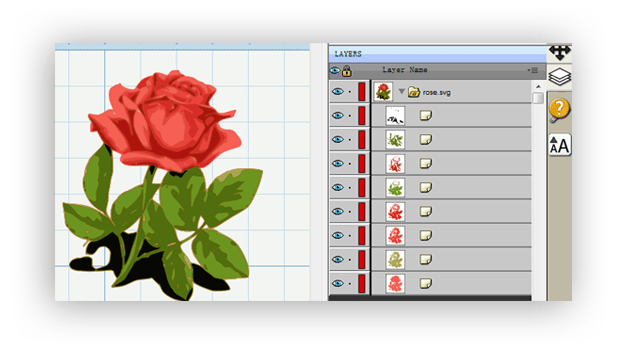 This powerful vinyl cutter software comes with a suite of various shape drawing and editing tools to draw and edit any shape directly on the mat. Easily draw unique shapes, modify signs, edit images, create logos, customize text with fonts on your computer plus special effects. 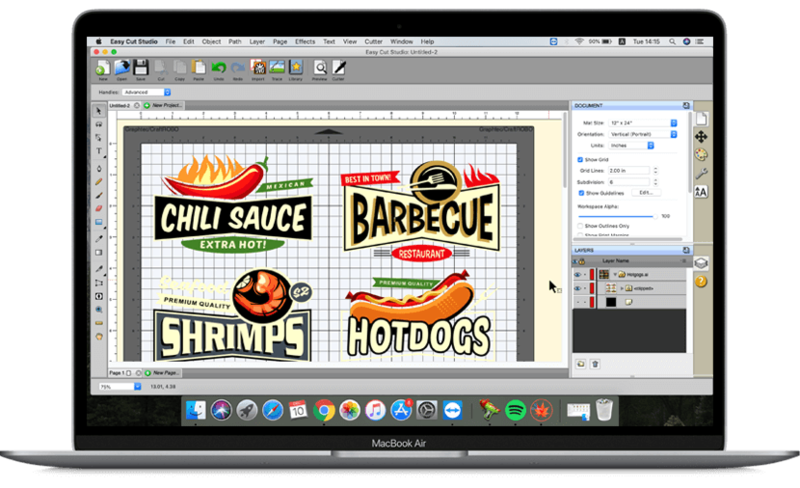 Easy Cut Studio will make you design and cut your shapes easier than with any other sign-making software in the market today. It is a little design powerhouse for vinyl cutting. Unmatched image vectorization, Simply use the powerful tracing tool to create cuttable outlines from any imported raster graphics (including PNG, JPG, GIF, PSD, PDF, BMP, TGA, TIFF, etc.) or scanned images. 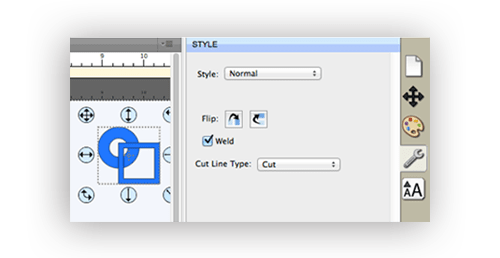 Easily create accurate vector paths ready for cutting or make further editing. Import various file formats, including SVG, AI, PDF, PNG, EPS, GSD, WPC and other popular vector formats as editable objects. giving you the power to cut any shape and custom artworks. You can also export your design to SVG, PNG, TIFF, GIF, JPG, BMP, or FCM format. Print to Cut made easy, fast and accurate. Automatic creation of registration marks for print and cut applications. Easily print your artwork and then cut out around the printed image using your vinyl cutter, which is perfect for create decals and stickers. User control over registration size, thickness and offset will help the cutter find the contour cut marks easily. 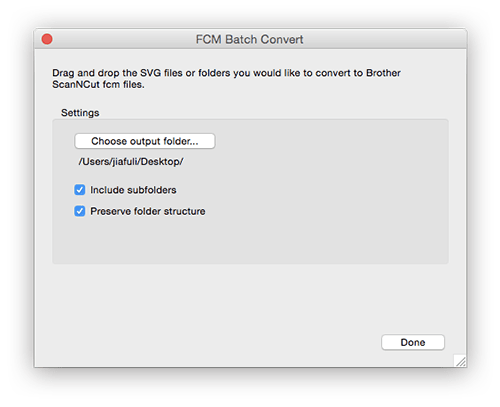 SVG to FCM Batch conversion workflow is unmatched by any vinyl cutter software on the market. 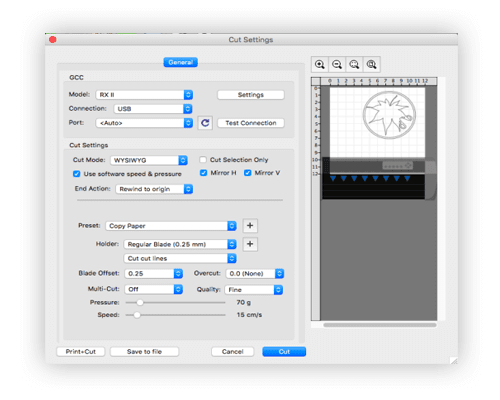 Easy Cut Studio will allow you to spend less time converting SVG to brother ScanNCut FCM file and more time cutting and playing with paper. Easily convert designs into rhinestone templates and make your own custom rhinestone designs with typeable rhinestone ready fonts. Specify stone size and spacing to make a rhinestone template and lattice shapes. 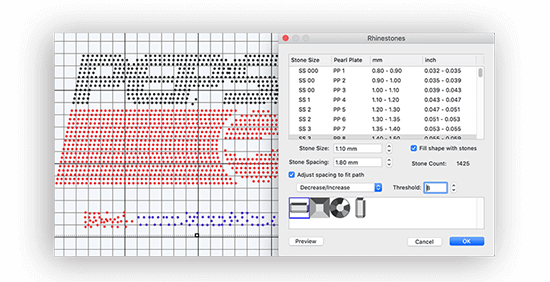 Just select an object on the screen mat, and then choose "Rhinestones" from under the "Effects" menu to bring up the Rhinestone window shown below. Welding is an advanced option allows you to make overlapping text and shapes to become a single shape, by joining shapes together wherever an overlap occurs. There are two ways to combine shapes/letters together: welding and joining. Easily create complex designs using multiple layers, grouping to organize the display order of objects. Using Layers can help you more control over how you organize, edit and cut objects with Easy Cut Studio. The Shadow Layer option will create cuttable shadows from any shape. Get the job done, faster. Flexible Cut Settings that allows you to cut exactly what you want. You can set cut mode, mirroring, cut selection only, pressure & speed, Print+Cut, multi-cut (Cut Copies), blade-offset, overcut and many more professional vinyl cutter controls. Cut vinyl signs with incredible ease. Works with a wide range of vinyl cutters/plotters including USCutter, Graphtec, GCC, Roland, Secabo, Summa, AnaGraph, PCut, Ioline, Refine, Mutoh, SilverBullet, Liyu, Redsail, GoldCut, PixMax, KingCut, JinKa, Vicsign, Seiki, SkyCut, UKCutter, Rabbit, Saga, KNK, Silhouette SD/CAMEO/Curio/Portrait, CraftRobo, Craftwell eCraft, i-Craft, BossKut Gazelle, Pazzles Inspiration/Pro/Vue, Master Vinyl Cutter, Vinyl Express machines and so on. (No longer work with the Cricut machines.). Click here to view all compatible vinyl cutters. Layout and special effects for your text and shapes. Place text or objects on bezier paths. Text on arch tool and text on path tool. 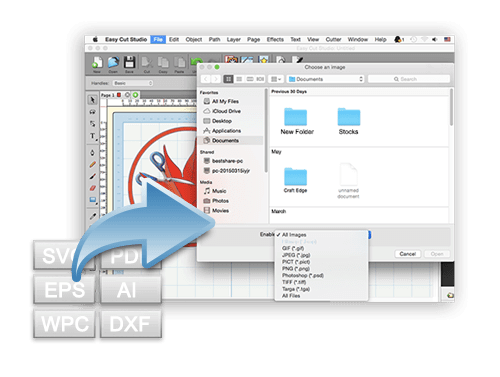 Cut font files already installed on your Mac or Windows. Stencil function for bridging interior shapes. Use any bitmap image to create a texture. WYSIWYC Interface - What you see is what you cut. Scan images directly into the software. Choose from over 250 pre-made shapes from the built-in library. Multi-color gradient fill function with linear and radial options. Option to cut only selected objects. Mirror or flip images before cutting. Support USB connection, serial (COM), parallel and so on. Generate jigsaw puzzles with full control. Using a vinyl plotter conveniently also requires an easy cutting software solution. ECS works awesome with my Roland GX-24 cutting plotter. 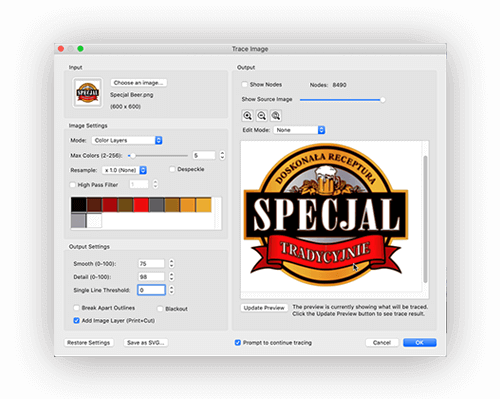 Its auto image tracing, powerful editing tools and advanced rhinestone features make it the perfect choice for vinyl cutter software. 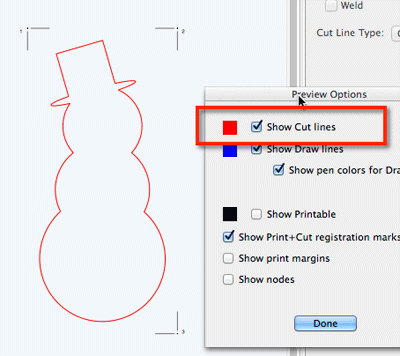 Your cutting plotter program is very easy to figure out and there are video tutorials available to help us learn how to use the software. Another one of important feature is the image trace. It take my low resolution images and make vector SVG images ready for cutting. It works perfectly and began to make my cuts from my MacBook Pro. The software helped me create exactly what I wanted! It is easy to use and you can cut any graphic in SVG format. I am New to the paper crafting world but I am so glad that I incorporated this vinyl cutter software into my creative flow. I am happy to say ECS is working wonderfully on my iMac. It takes my USCutter cutting machine to a whole new level. I've used it to cut a variety of vinyl signs and decals using my own artworks. A really nice vinyl cutting program for a really affordable price. © 2019 EasyCutStudio.com. All rights reserved.